If you’re somebody who plays video games, it is likely that you have recently heard of, if not played, a game by the name of “Super Smash Brothers Ultimate.” Released on Dec. 7, 2018, “Super Smash Brothers Ultimate” is the fifth installment of the famous Nintendo “Super Smash Brothers” fighting game franchise for the Nintendo Switch, and is possibly the best yet. For those unfamiliar with the game, “Super Smash Brothers Ultimate,” as well the entirety of its predecessors, follows and have followed a very simple structure since the release of its first installment in 1999: beloved characters from across various Nintendo video game series battle in one crossover fighting game. Although it may seem like a structure for a game which would get old after so many years, “Super Smash Brothers Ultimate” introduces better graphics, unique game mechanics, and an ever-expanding character roster which includes both entirely new characters as well as every character from all of the game’s predecessors. “Super Smash Brothers Ultimate” is for the Nintendo Switch, which allows for beautiful graphics and thoughtful character animations, incredibly responsive and fast gameplay, and, most importantly, portability. 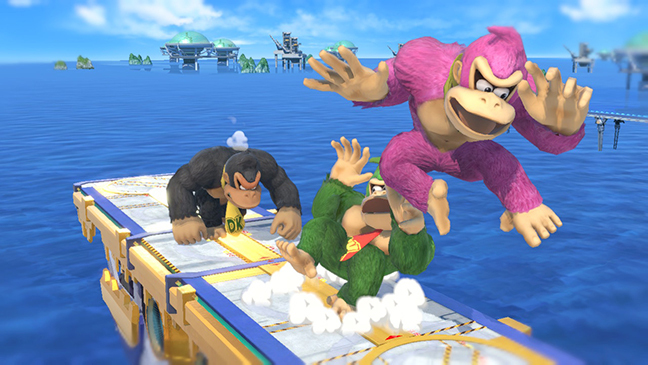 Being that the “Super Smash Brothers” games have been best enjoyed when playing with friends or through online matchups, the next step in the franchise was to find a way to mobilize it while retaining both the graphics and playability of a game that could be found on a non-portable console. With the introduction of “Super Smash Brothers Ultimate,” players now have the freedom to play quick games anywhere. Additionally, such new in-game mechanics as directional dodging and parrying (or what players sometimes refer to as a “perfect shield”), add a new dimension particularly to competitive play. Though some may argue that these mechanics, as well as the overall increased sensitivity of the controls within the game are quite different and require some time to get used to, this is somewhat of a triviality in light of such a great game. However, one somewhat unforgivable aspect of the game are the dramatic pauses which seem to occur at random times when a player gets a kill; it distracts players during intense games, and there does not seem to be any way to turn it off. Aside from this, “Super Smash Brothers Ultimate” for the Nintendo Switch is certainly the most heavily anticipated game of 2018, and continues to be wholly relevant through 2019. It is a unique, intuitive, and streamlined fighting game by Nintendo. Need I say more? Please play this game.